I feel some sort of clarification or explanation is in order. I’m enough of a baseball nerd to have a favorite team (Oakland A’s), a favorite player (Dallas Braden) and a favorite pitch (the knuckleball). It’s a pitch thrown by few and mastered by fewer. It’s not actually thrown with the knuckles, but with the fingertips, kind of. The knuckleball is one of the slowest pitches in baseball. Whereas the average major league fastball goes 92-95 mph, the knuckleball sits in the 50-60 mph range. It goes so slow and is thrown with minimal rotation that it seems to wiggle to batters. 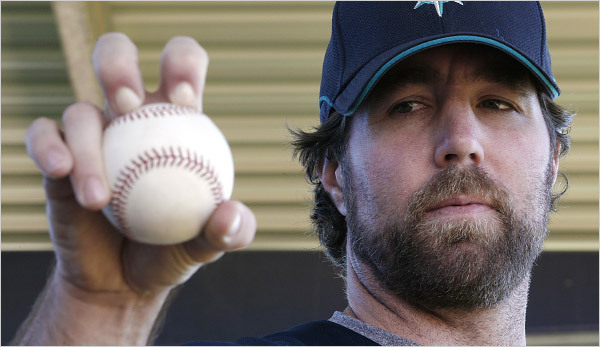 There are only two MLB pitchers who throw it now: the ageless Tim Wakefield of the Boston Red Sox and R.A. Dickey of the Minnesota Twins. There are a couple guys in the minors like Charlie Zink (Red Sox) and Charlie Haeger (Dodgers), but this is largely a dying pitch. The failure rate is high and (I know this from personal experience) it’s hard to control. Why do I love the knuckleball? It’s humanizing. Along with its distant cousin, the Eephus, it’s highly entertaining to see millionaire major league hitters whiff on a pitch that barely breaks the speed limit. Even legendary hitter Wade Boggs threw a knuckleball! So I felt this blog should be somewhat like the knuckleball. Sometimes successful, sometimes not. Sometimes on target, sometimes not. Kind of fluttery, but hopefully entertaining most of the time. Next Post Can someone explain this to me?